Special programs elections 2016 have opted for the application of Augmented Reality television. 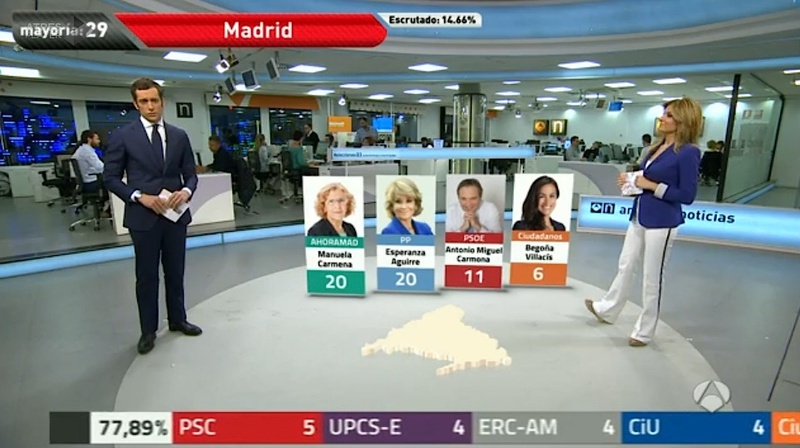 In previous elections, particularly local May 2015, Antena 3 joined Augmented Reality in the presentation of data in real time. As is well defined, augmented reality, is the technology that incorporates virtual elements on a real background. The advantages of the application of augmented reality television is that we can see in a non-intrusive data results. Presenters are about making more accurate data for the viewer indications. This year Spanish Television, with this technology, include the presenter live as an element of augmented reality on broadcast television. In previous elections, TVE and other chains like Antena 3, TV3 and Canal Sur incorporated this technology in the presentation of data in real time with a very good integration of these data (Virtual) with real elements. RTVE involved in the project Visualmedia Horizon 2020 (H2020), the Framework Programme for Research and Innovation of the European Union for the period 2014-2020. Recently launched Vision Boosts RTVE, an initiative to support entrepreneurship and innovation of the Corporation and Star HD, the new thematic channel RTVE for America with the best series and entertainment programs in HD. With this new addition to television, the Augmented Reality technology has established itself as an application to add value to the information provided. Along with marketing, advertising and education aumentad reality television is consolidating.